An astronomical event! 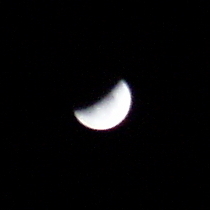 I tried over and over to get a non-blurry photograph of this lunar eclipse (once the clouds cleared; I missed Totality but I caught the shadow moving away). This was the least blurry; at least it looks the right shape, not an unrecognisable blurry blob.